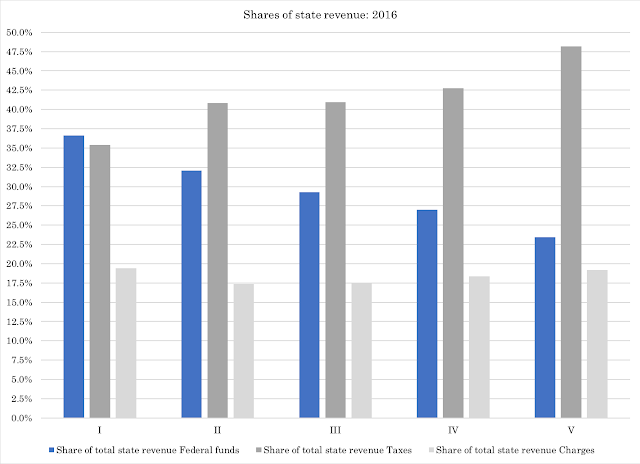 In fairness, it is a bit difficult to compare states based on a simple aggregation of state and local governments. Some states place the responsibility for certain functions at the local level, while others prefer to centralize functions in the hands of the state government. Furthermore, local governments are fiscally dependent on state governments to a larger or lesser degree, affecting the distribution of responsibilities between the two levels of government. More on local governments in a coming article; for now, let us take a closer look at the state level. 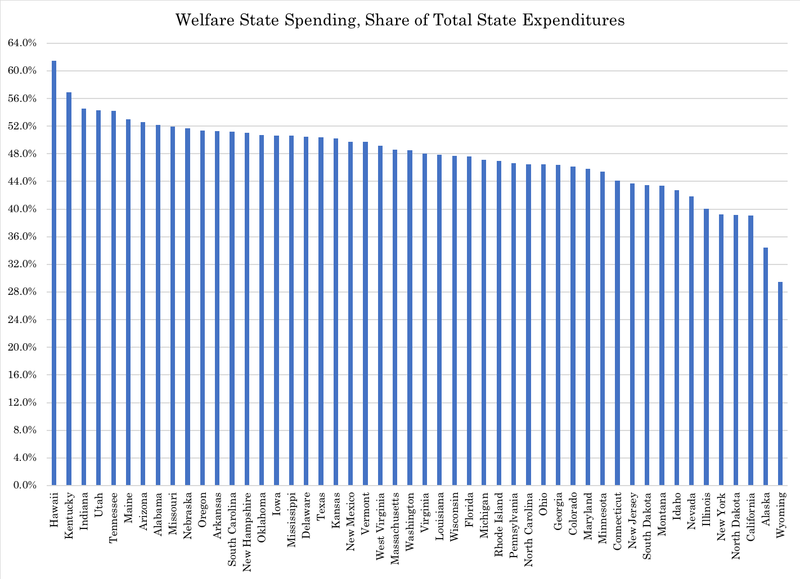 To begin with spending, the 13-percent allotment of combined state and local government spending tp core functions worsens when we isolate the state level. On average, state governments spend only 8.2 percent of their budgets on public safety and transportation. It could be countered that public safety is, and should be, primarily a local government responsibility. This is a good point, but let us keep in mind that this is a percentage: if the states do not have to spend a lot of money on public safety because counties, cities and towns do it better, there is nothing that says they should spend more money on other functions instead. Let us keep in mind, again, that states distribute spending responsibilities differently between the state and local governments. Overall, though, the fact that states use almost half their budgets, on average, for the purposes of economic redistribution is a sign of how entrenched the welfare state has become. While we are talking about spending priorities, it might be worth noting that states are relatively frugal when it comes to general government administration, but that there are some weird priorities being made. Administration claims the most in Montana (6.0 percent of total spending), Alaska (5.6), Delaware (5.5), Wyoming (5.0) and Connecticut (4.8). Its share is lowest in Michigan (1.3), Texas (1.4) and Illinois (1.5). That said, a low share of the budget going to administration is not necessarily a reflection of overall sound budget priorities. Some states spend quite a bit more on administration than they do on public safety: the state of Hawaii doles out $1.80 on administration for every $1.00 on public safety. They are followed by Montana ($1.53), Connecticut ($1.49), Wyoming ($1.47) and Alaska ($1.46). It is not a sign of good fiscal stewardship when a state government spends more on its administration than it does on public safety; even if public safety is primarily a local-government responsibility, it should not be the case that administration costs more than public safety. Fortunately, there are states that strike a more reasonable balance between the two. Michigan only spends 34 cents on general government administration for every dollar on public safety. Texas is a close second ($0.39) followed by Nebraska (0.46). In Rhode Island, interest on state debt is costlier than public safety, transportation and administration. On the revenue side, the biggest problem is state dependency on the federal government. Over time, federal funds have become of increasing importance to states. This dependency is directly traceable back to the expansion of spending programs, created by Congress, that give states the responsibility for running the programs while Congress maintains a funding responsibility. I recently pointed to this problem in an article for the Center for Freedom and Prosperity, but it deserves a lot more attention than it gets. Alaska gets $2.73 from the federal government for every $1.00 they collect in taxes; New Mexico is a distant second ($1.25) followed by Louisiana ($1.11), Mississippi ($1.07) and Wyoming ($1.01). Next, we will take a look at local governments. After that, it is time for some longer-term trends. However, there will be other articles in between. Stay tuned, and don't forget to listen to Larson's Political Economy on blog talk radio! Next show is tomorrow Thursday at 8PM ET / 6PM MT!